Hilary is a certified member of the Society of Teachers of the Alexander Technique, the world's oldest and largest professional body of Alexander Technique teachers. "You are not here to do exercises or to learn to do something right, but to get able to meet a stimulus that always puts you wrong and to learn to deal with it." During Alexander lessons you are gently guided as you learn how to sit, stand and walk in a new way. You gain awareness, learn to move more freely, and improve your coordination and posture. Gradually you learn how to apply these changes in everyday situations and to increasingly more complex activities. You gain a technique you can use throughout your life. 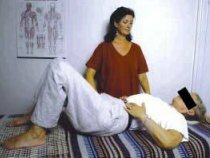 Lessons in the Alexander Technique are a process of exploration and discovery, with the teacher's hands and verbal instructions gently guiding pupils through activities such as sitting, standing and lying down, so that unhelpful reactions and habits may be recognised and gradually stopped. In so doing, we become freed to choose new responses to situations. We also learn to give ourselves a set of instructions or 'directions' so that we move with more awareness and poise, often reducing pain and discomfort in the process. "It is not getting in and out of chairs even under the best of conditions that is of any value: that is simply physical culture. It is what you have been doing in preparation that counts when it comes to making movements." As we progress in our understanding and application of the Alexander Technique, we can explore more complicated activities such as carrying things, using computers or playing musical instruments, gradually applying this learning to all aspects of our lives - even scrubbing our teeth! Many people improve their posture, co-ordination and performance as a result; they tend to feel happier in their bodies and research has shown that they can also increase their sense of well being. You will feel more comfortable in loose clothing in lessons, as sit, you move around and lie down on the Alexander table. Please avoid hoods as these get in the way! You will be asked to take your shoes off. Occasional Alexander Technique workshops and short courses on the Technique are available. However, because our patterns of 'misuse' are so personal to each of us, the main learning of the Alexander Technique needs to be through individual lessons. I have provided a list of insurance companies that have been known to reimburse people for at least some of their Alexander Technique lessons in the UK. Based in North London (Stoke Newington, N16), introductory lessons are 1 hour; subsequent lessons are usually 45mins long but 30 minute lessons are also available, particularly for children. It is advisable to start with one or, even better, two lessons a week. Later, you can drop down to fortnightly then less regular lessons as you progress. A foundation course of about twenty lessons is recommended by STAT, so that we can gain an understanding of how to use the AT in our daily lives,and research has shown that it is possible to gain something useful out of just 6 lessons. Most people enjoy their lessons! Please contact me to find out about my current fees structure. Car: Restricted street parking, Zone M.
Please note 2 days notice of cancellation is required. If I am able to reschedule the lesson within the week, I will be happy to do so. Otherwise, the lesson will have to be paid for. Information and a register of qualified Alexander Teachers, who have undergone a recognised three-year training, may be obtained from STAT (the Society of Teachers of the Alexander Technique).